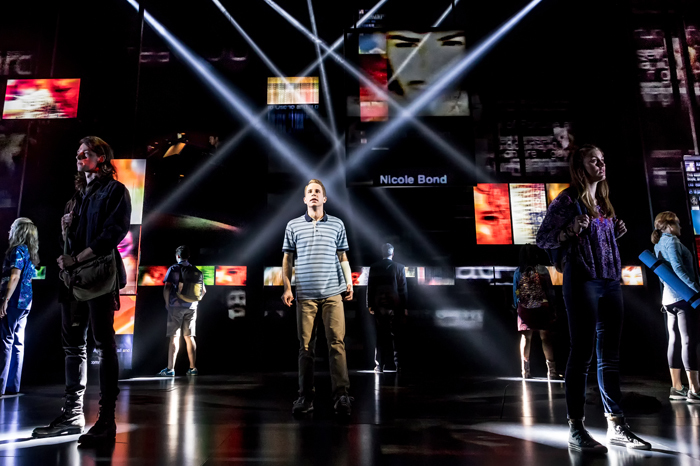 WorldStage has provided an extensive media-server driven video package for the hit Broadway musical, “Dear Evan Hansen”, which relies on the technology to tell the story of a high school senior coping with social anxiety disorder. It is currently playing to packed houses at the Music Box Theatre but WorldStage supported the show’s initial Arena Stage production in Washington, D.C. as well as its Off-Broadway run. “Everywhere you look there is video: Every surface of the entire playing space can be covered by content whether projection or LCDs,” says projection designer Peter Nigrini. Display surfaces comprise a front projection system, a series of portals and tracking panels, flat-panel LCD monitors and the stage floor. To achieve Nigrini’s look for the social media environment WorldStage utilized d3 media servers from d3 Technologies. WorldStage also supplied Panasonic PT-DZ21K projectors as well as Panasonic PT-RZ12K laser-phosphor projectors; and a pair of Panasonic pan-tilt-zoom cameras, which are used to create live interactions on stage. The d3 systems also feed video to several dozen 32- and 40-inch LCD monitors and are connected to the automation computer for tracking moving scenery. Nigrini notes that WorldStage began work on the production two-and-a-half years ago in Washington. “It’s a long process to become a hit Broadway musical,” he says. “WorldStage is great at understanding that it’s a long, long game. At WorldStage Tom Whipple is the project manager for the show and Alex Bright the media server technician.